Recommendations change from year to year and from expert to expert. For as long as we can remember everyone has advised that stretching before exercise is the key to avoiding injury. But now opinions (and scientific fact) appear to be changing. Does anyone remember the 2005 Ashes series? Of course you do!! Flintoff somehow managed to avoid injuring himself despite being right at the end of his international career, and having suffered countless injuries leading up to the tour. One of the things this was attributed to was the fact that he stopped stretching as part of his warm up when preparing for a spell bowling. To understand the theory behind this, we first need to understand a little of the science. 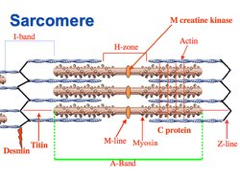 Muscle fibres are made up of microscopic segments called sarcomeres (see diagram below). There are millions of these in each muscle fibre, and the function of them is to shorten the muscle fibre- resulting in contraction of the muscle. To do this, the “Z lines” in the diagram must come closer together, so the thick filaments must slide along the thin filaments. They do this using tiny little “hook and lever” type proteins called myosin heads. These heads come from the thick filament, and attach onto the thin filament, and then the lever swings, causing the two filaments to slide past each other. So what’s wrong with stretching? When you stretch, you lengthen the muscle fibre, meaning the Z lines are further apart. This in turn means that there are fewer myosin heads connecting the thick and thin filaments. As a result, when you then powerfully contract the muscle, it is more likely that the myosin heads might “lose their grip”, resulting in a muscle tear. A recent study published in the Journal of Strength and Conditioning Research found that when weightlifting, those who did not stretch before training were able to lift more weight than those who did. It also found that those who stretched before training reported feeling more unstable than those who did not. It is important to note three things when considering this: firstly, the stretching we are talking about is static stretching, i.e. stretching a muscle until it hurts and then holding it for a set period of time whilst not moving. The concept is very different from dynamic functional stretching such as a squat with rotation whereby the muscles are being stretched and moved in an action that mimics the action that is about to take place. Secondly, we are only talking about stretching before exercise… stretching afterwards is a very different kettle of fish, and generally is much more worthwhile. Thirdly, we are only talking about stretching, NOT warming up… warming up is still key both to avoiding injury, and protecting your cardiovascular system, as well as making the most out of your workout. As options continue to develop with regards to stretching there is no doubt that warming up before any fitness programme is vital. With regards to the change in performance that has been demonstrated by scientific studies, this may only be applicable to elite athletes that some of us strive to be like – which unfortunately counts most of us out! However one of the biggest benefits of stretching may be one that research can't quantify: that it just feels good. And if it feels good for you, it almost certainly is.